An environmental group says an incorrect map may have misled the public about a proposed liquefied natural gas project near Prince Rupert. The Canadian Environmental Assessment Office is currently reviewing the Pacific NorthWest LNG export facility and marine terminal. 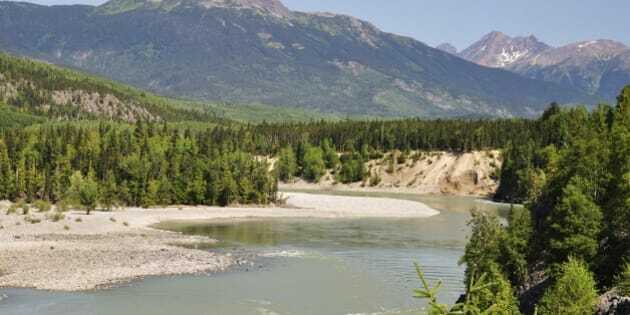 The project originally omitted the Skeena River — a major river near the proposed plant — from a map in its review application. The incorrect map was posted on the assessment office&apos;s website while it was seeking public comments and applications to participate in the review process. Those deadlines have now passed. Jessica Clogg, the executive director of West Coast Environmental Law, fears the mistake may have influenced some people&apos;s decision about whether to participate in the review. "It was supposed to allow citizens to consider whether they would be impacted, or whether values they care about would be impacted, and whether they wanted to have their voice heard,” she said. “And there is a risk that people made a decision on the basis of incorrect information." Clogg is calling on the Canadian Environmental Assessment Office to extend the deadlines. A spokesperson for the office says it is reviewing the request. The company that created the map says the missing Skeena River was the result of a "technical error." The mistake has been corrected and a new map has since been posted. The proposed project would see a $25-billion facility built off the coast of northwestern B.C. Pacific NorthWest LNG plans to build three so-called trains, the cooling units where the liquefication of gas occurs, on Lelu Island in the Port Edward district south of Prince Rupert. The site will be used to liquefy and export natural gas produced by Calgary-based Progress Energy Canada. The trains will eventually produce six million tonnes of LNG per year each for about 25 years, with a total capacity of 19.68 million tonnes a year when all trains are functioning at 100 per cent, which is rarely the case. The project would also see a 750-kilometre pipeline constructed to supply gas to the plant.